As a student, transportation in Ithaca can be challenging, specially when one does not have a car and walking is exhausting because of the hilly nature of this city. 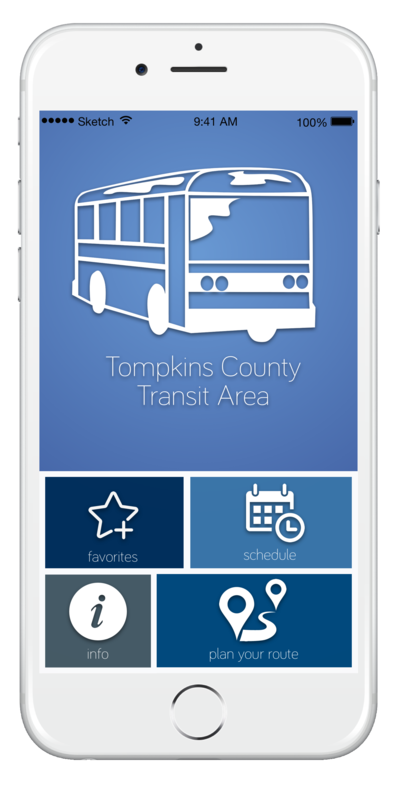 While Ithaca has a bus service, called the Tompkins County Area Transit (TCAT), figuring out the bus schedule and routes can become confusing because there are so many of them. This becomes even more tricky when the weather gets worse or when students barely have any time to shuttle between classes located at far off distances from one another. In such situations, they just want to get on the bus right outside their lecture halls, residence halls, gym, downtown etc. 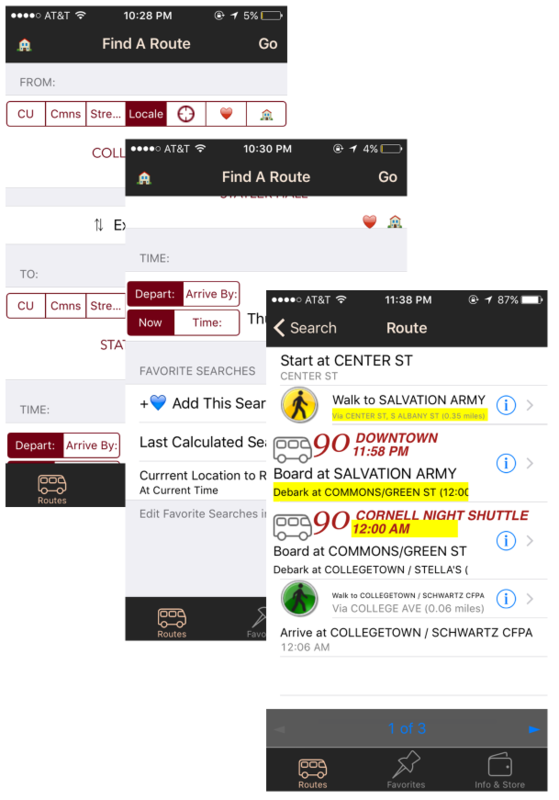 The existing app solves the purpose, however it doesn’t provide much usability and accessibility to key information. The app is overloaded with excessive information, a bad navigation and even a worse user interface design. I decided to redesign it for a hobby project, and incorporated design principles of usability and readability, while simultaneously delivering a good user experience. Users are confused by so many ways by which they can select “start” and “end” locations. 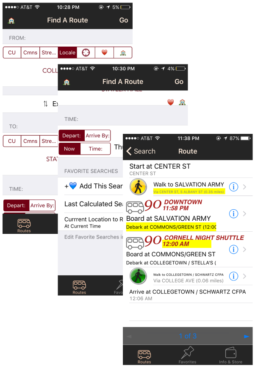 Clicking on a bus route shows a picture of the bus stop, image is too small and almost useless. Decoding the detailed Route Map is time consuming and ineffective for mobile screens. 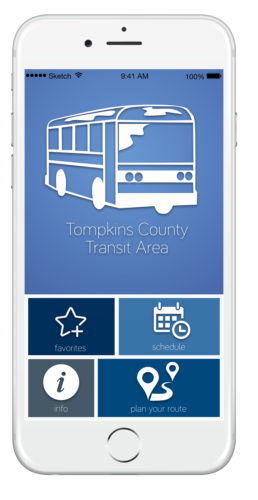 Users rarely use the “Arrive By” option while choosing a certain time to plan a route. 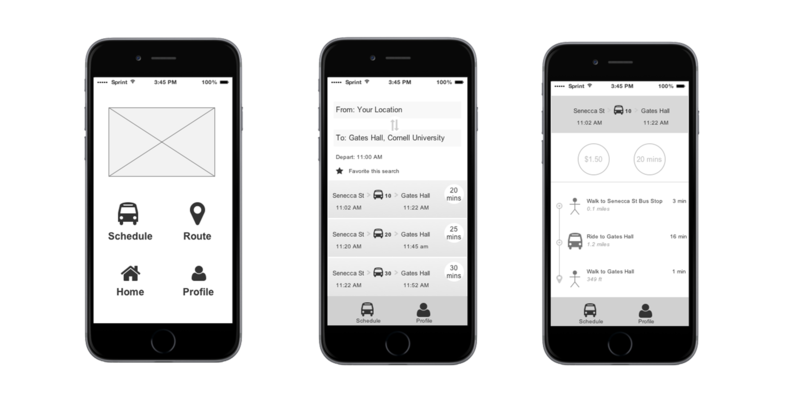 Users want an integrated map feature so that they don’t have to leave the app and use another app for directions. The mid-fidelity wire-frames above were created using Axure™ , and were based on the revised designs. All visualization in this project have been completely designed, wire-framed, and prototyped by me using Adobe Photoshop™, axure™, and Sketch™. Icons used are either royalty-free or designed by me.